Boralugoda Ralahamy’s grandson Dinesh Chandra Rupasinghe Gunawardena was born to Philip and Kusuma Gunawardena on the March 2, 1949. His father Don Philip Rupasinghe Gunawardena is known as the Father of Sri Lankan Socialism. His mother Kusuma Gunawardena, was the first and only woman MP to return uncontested to the Parliament of Ceylon. It is during the time that Mrs. Kusuma Gunawardena was actively articulating the political programs and philosophy of the party and that of the husband in Parliament that Dinesh Gunawardena was born. Dinesh studied Business Economics as his main subject in the Netherland School of Business (Nyenrode University). Having successfully completed his higher diploma in International Business he obtained a scholarship to the University of Oregon, USA. There he graduated with a degree in Business Administration and International Transport. In New York he obtained employment in a prestigious organization. It was during this time that his father passed away. After some time Dinesh returned to Sri Lanka to carry forward the political programs of his father and guide the destinies of the MEP. At the by-election held in 1983 Dinesh was elected with a massive mandate from the voters to become the Member of Parliament for Maharagama. In 1985 his mother passed away. Soon Dinesh had to suffer a very tragic loss in the untimely passing away of his wife, leaving behind son-Yadamini & daughter-Sankapali who were at that time 5 years & 4 years of age, respectively. Following the Indo-Lanka Accord in June 1987 Dinesh struck common cause with Mrs. Sirimavo Bandaranaike and other political leaders who shared a common stand for the protection of the unitary state and the heritage of this country. Dinesh was actively involved in support of the candidature of Mrs. Bandaranaike at the second presidential elections. His contribution was manifested in the highest number of votes cast for Mrs. B from the Maharagama seat, though she was defeated. Parliament was dissolved even before the results of the presidential polls were announced. At the general elections of 1989 Dinesh lead under the MEP banner and was successful in holding the Maharagama seat. Under his leadership 3 of the MEP members found representation in Parliament. Thereafter, Dinesh continued to play a leading role in the Parliament as a front bencher of the Opposition lead by Mrs. B. The ruling party was calculatedly whittled down some of the progressive measures that were taken in the wake of 1956 victory as evident in amendments to the Paddy Lands Act, the mutilation of the CTB act and the formation of cluster companies, which turned out to be white elephants. Most of the related Bills were challenged in the Supreme Court at the initiative of Dinesh. There was also a move to introduce amendments to the Archeology Ordinance to remove the control of temples from the hands of the Viharadipathis and vest it in the hands of laymen. Dinesh the and master of Parliamentary procedures was very vigilant and alert enough to take the then government by surprise in calling for a early vote on this Bill when the government benches were depleted. 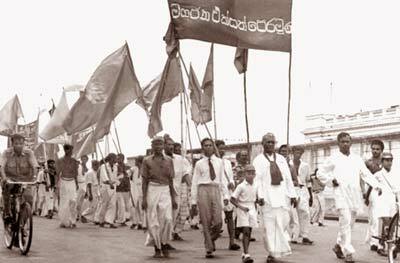 Dinesh with his legendary and visionary father Philip Gunawardene at the Mahajana Eksath Peramuna May Day procession in 1956. This move resulted in the first and only defeat of a Bill presented by the ruling party in their 17 years of rule. When attempts were being made to reintroduce this Bill, after much agitation and with representations made to the Supreme Court inviting attention to the legal effect of this Bill which should have had the effect of contravening Section 9 of the Constitution, Dinesh successfully checkmated that move. Dinesh interacted with the leaders and other important persons in various continents for the mutual benefit of Sri Lanka and the respective countries. He met Prime Minister Rajiv Gandhi in a delegation that had been sent to Delhi to attend to certain outstanding issues arising out of the Indo-Lanka Accord. He maintained a personal relationship with Dr. Vinyaka Purohit, freedom fighter of India, Mrs. Isabella Allende, daughter of legendary Allende of Chile, Evo Morales, the present President of Bolivia, Mrs. Sisulu-daughter of two stalwarts of the ANC movement and close associates of Nelson Mandela the legendary freedom fighter, and especially Uhuru Kenyata, son of Jomo Kenyata-the Father of the Kenyan nation and colleague and associate of Philip Gunawardena in the struggle against colonialism and imperialism. The year 1994 was rather eventful for the MEP lead by Dinesh. At the general elections of 1994, the MEP became a victim of a small coterie of persons-political enemies-who were calculatedly biding their time to shut out the MEP from the alliance that was forged. Dinesh, nevertheless, forged ahead with his campaign to save the national heritage and the unitary status of Sri Lanka. The MEP, however, joined the alliance in 2000 and reasserted the stand on the unitary status and the heritage of this country. After the Elections of 2000 Dinesh was appointed as the Minister for Transport and Environment. During his tenure the Ozone Summit was held in Sri Lanka solely due to the untiring and enthusiastic efforts of Dinesh. He prepared a Bill to restore the CTB by doing away with cluster companies. It didn’t see light of day due to defection of a section of the then government group. This Bill was later presented in Parliament in 2007. The defection precipitated a general election which resulted in the defeat of the government. When the new ruling party sort to bring legislation to do away with the pension scheme in the entire country, Dinesh counter moved to checkmate this exercise. The pensioners’ rights have thus been conserved to this date. Dinesh as an Opposition Parliamentarian, both in and out Parliament, fought strenuously against any inroads been made into the unitary state of Sri Lanka or any erosion of the national heritage of our country. He moved to forge a broader alliance to counter local and foreign conspiracies against Sri Lanka. His campaign proved fruitful and the result was the United People’s Freedom Alliance. The UPFA registered a landslide victory at the 2004 general elections. This was followed by the victory of his then Prime Minister Mahinda Rajapaksa at the Presidential election, which signalled the birth of a new order with a new outlook and with a new determination to grapple with the burning challenges of the day. From this time he has been holding various other Ministries pre-eminent of these being the Minister of Urban Development, besides higher education, water supply and sacred area development. It is to his credit that the Uva Wellassa University stands today with a new outlook to meet the challenges of the present day. As Minister of Water Supply he has procured and established the Greater Kandy water scheme despite considerable difficulty much to the acclaim of the people of the Kandyan areas inclusive of the Temples of the Malwatte and Asgiriya chapters within Kandy. In the matter of Sacred Area Development his projects have accommodated all religions and all races throughout the island. The Kusum Nivasa project, the brainchild of Dinesh, which is under the newly established Urban Settlement Development Authority is unique. Dinesh has a pragmatic approach to the problem confronting this country. This is articulated in his address to an influential segment of the business community, thus, “We need some fresh air if we are to resolve the problems confronting Sri Lanka, of which the major infirmity is a stagnant economy. Then the problems of the deprived Sinhalese in the South and the deprived Tamils in the North, and of the Muslims will come out in the wash”. 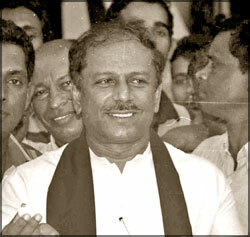 Dinesh Gunawardena who is also presently the Chief Government Whip turns three-score years today, March 2.